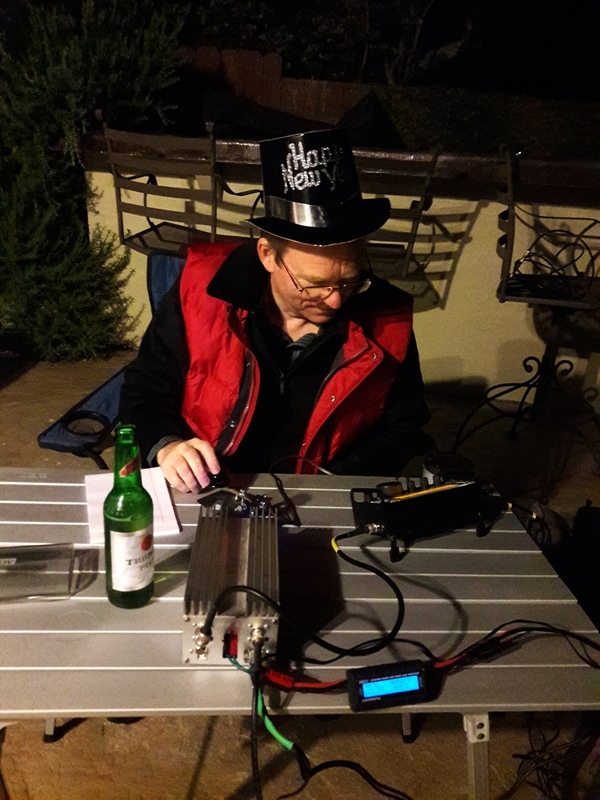 Every year, on New Year’s Eve, Ham radio enthusiasts have a tradition of making a special effort to contact one another using Morse Code and an old-fashioned telegraph key. The event is called Straight Key Night. I’m a little new to Morse Code, and this was only my second year of participation. As I did last year, I set up a portable station on my sister’s backyard deck in Moraga, CA. At around 9:00pm local time, around the time the ball was dropping at Times Square, I stole away from New Year’s Eve festivities for a few minutes to “play radio”. I listened for a while, heard many stations on 40 meters, found an open frequency, and sent out a “CQ”. On my second call, Ray, W6GLF, came back to me with a strong signal from Kirkland, WA. Thanks, Ray. We had a nice chat, and then I went back indoors to warm up and report on my success. The indoor party was fun, and it turns out that I didn’t brave the cold again to make another contact. So I only had one contact for this year’s SKN. But I participated, and enjoyed the magic of communicating with another human over a long distance by simply tapping on a telegraph key. Also, I didn’t neglect my friends and relatives who were in the same house as me. So while it wasn’t much of an accomplishment from an Amateur Radio perspective, on balance, it was a fun part of closing out the year. I recently found out that the SKCC sponsors their own monthly informal Straight Key Night, on the first day of each month. I’m not one for New Year’s Resolutions, but I intend to participate in at least a few of these events over the upcoming year.